Enjoy the mysterious atmosphere of cold still waters; immerse yourself in the eerie silence of oceans deep with one of the best sonar simulation screensavers around. 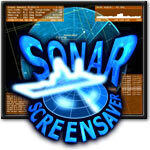 This fascinating and detailed sonar simulation software gives your PC the appearance of a true sonar display. Unlike real marine sonars, this model offers far more sci-fi details, animations and effects to blend an oceanic spirit with the hi-tech world of underwater fiction. Establish full-scale radar to your desktop. Watch the aircrafts flying through the controlled area and identify them by satellite images. This screensaver has a lot of settings like detail level, air traffic intensity or colors. If your computer has more than one display connected, Radar Screensaver will let it look even more closely to fabulous radar outpost. Place realistic fireworks simulation to your desktop. We simulated most physical aspects, like gravity, glowing sparkles, explosion lights, smokes and sounds, recorded from real fireworks events. Virtual camera mode allows viewing the fireworks from different point: it flies between explosions and lets you feel like if you were inside. This conceptually simple but beautiful and modern screensaver will give you many hours of interesting and fascinating animation. Watch metallic rings rotating one inside another in front of spherical panoramic images. The screensaver allows changing many settings like rings count, their colors and dimensions, amount of lights and one of five background images. This screensaver simulates a flight at superlight speed through the galaxy. It can be used to replace old starfield simulation screensaver that ships with Windows. It can simulate thousands of stars, interstellar gas clouds and flight along non-linear path. To immerse you into the atmosphere of transgalactic voyage, it will play fascinating soundtrack, included into distributive, or your own. WebFormAntiSpam is a complex solution for easy and fast making an effective protection for web forms against spam. It includes software for encoding forms, what makes them unreadable and unrecognizable by spam bots. Any of the popular Internet browsers can display the encoded pages absolutely transparently for the visitor. The spam bot will see only a script without any trace of web form and will ignore that web-page.